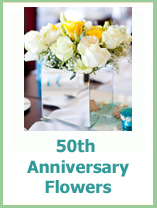 50th wedding anniversary planning can seem rather daunting as it is such a special day and celebration. 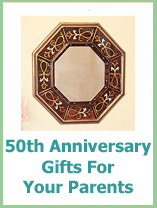 A celebration that you will want to be perfect. The key is to plan and get as much help as possible! First, think about how your anniversary couple would like to celebrate. Do they love a big party or will they be more at home staying at home and having a more intimate get together. Knowing who you are going to invite and the number of possible guests will help when you are looking for where you are going to have your party. With 50 plus years together there will be a lot of family and friends! When you start looking for a venue you will also need to think about the type of party you want to have. Are you planning a sit down dinner with dancing, a tea party, a buffet as this will have a big influence on the room that you will need. Plus it will have a big impression on the budget too! If you have a number of guests that will be travelling to your party it would be helpful to find accommodation to suit all budgets. It will be nice to have as many people to celebrate with you as possible, you don't want them put off by the cost of coming. When you have decided on your venue you will need to secure it with a deposit. Look to choosing the food you are going to serve. This may be as easy as choosing from the choice of your venues menus or you may have to think about hiring a caterer. Or you may be looking to cater the party yourself! With all the plans in place you can look at sending out your invitations. And now you have time to do all the fun bits like choosing an anniversary cake and organising flowers and decorations. I have found that having a checklist when you are planning any type of party really helps to ensure you don't forget anything. I have put together the checklists that I use for anniversary parties. The timeline is good for when you are not sure where to start! Free printable anniversary party planning checklist here! Free anniversary party tips and timeline. If you need any party planning help please drop me a line in the help section at the top of the page and I will get back to you.